Happy July Everyone! We are back from Young Living’s 2018 International Grand Convention, rested, refreshed, and ready to tackle the summer. What a fun and incredibly inspiring time we had! I just love this business so much, I can’t even call it work! Check out all our shenanigans at www.yourserendipitouslife.com tomorrow (July 3rd) with our upcoming blog all about our experiences, what we’ve learned, and what we are most excited about. We had such an amazing time learning, growing, and connecting with all our crossline friends from Young Living. What a blast! Just when I thought Young Living couldn’t get any better, they hit it out of the park with the release of their latest products. So, let’s chat and I will let you in on some little secrets about these gems. You will definitely want these in your house! Let’s start with some personal products (my personal favorite’s) all of which have NO sulfates, parabens, dyes, synthetic fragrances, petrochemicals or any yuck! Young Living released their 1st acne approved treatment. This goes above and beyond any spot acne treatment I’ve seen in my years skin care work. Key ingredients are: Salicylic Acid derived from Wintergreen so it won’t over dry, but help clear acne, blemishes, pimples and blackheads. It carries tea tree and malaleuca which help reduce your healing time. With added aloe to soothe the area. One of my favorite ingredients in this gem is Willow Bark extract, which helps to brighten your skin. You can use this on spots or as part of your daily routine on those hard to manage areas. Young Living reformulated their #1 cleanser to make it even better. No more wheat for a completely hypoallergenic cleanser designed with sensitive skin in mind. It reduces oily skin and surface oils and contains naturally cleansing essential oils like Copaiba and Orange. Oh, and of course it smells so amazing!!! It’s super easy to use and control your portion with its new pump. It perfectly complements the Orange Blossom Moisturizer. One thing I found Young Living was missing form their skincare line was a moisturizer made for oily type skin. I have to say, I am loving this one. Not only does it smell lovely, it helps control my oily skin while keeping it moisturized. It’s non- greasy and non- irritating. The ingredients they added to this one had me all excited. Licorice root extract is one of my go to’s in my spa. Talk about some bright skin, and Micro algae (GOOD BYE AGING SKIN). Young Living brought two new products to the table with their Mirah line and they are so luxurious. If you haven’t used a cleansing oil for your face you are missing out. Check out my video in The Oily Esthetician group on this. Oil attracts oil, so your face is left clean and hydrated. With amazing essential oils like bergamot, rosemary, jasmine and roman chamomile, this will become one of your favorites for sure. I have Oily skin and love love this one. However, I only use it once a day, at night actually and do a double cleaning, once with Mirah and once with orange blossom. Your face will love you! Mirah hair oil has more than one purpose. I love it in my hair damp, as a heat protector, on my fly aways, on the ends of my hair, and its pretty awesome for your cuticles too! It has Argan oil, which is light, ROSE (uh, yes please), and Ylang Ylang essential oils. Plus lots of fatty acids and vitamin E in this one to make your hair shiny and glossy! HOLLAR!!!! Ready to unclog your pores? I’m loving this for my teenage clients backs and chest. Where I wouldn’t recommend this for someone with more mature skin, this can be added to your teenager’s face routine. Charcoal powder is the ultimate way to detoxify. Think underarms soap peeps! Everyone needs this one! A little aloe and orange essential oil has it smelling so fresh and clean. You asked and Young Living delivered! I’ve been using this and absolutely LOVE it! It spreads super easy and contains some crazy good ingredients like Helichrysum, Lavender, Frankincense, and Carrot Seed essential oils. Can you say HIGH FREQUENCY!!!! Yay FRANK for the WIN!!! And my favorite, favorite thing about this sunscreen is that it’s reef safe. Last year Young Living released their Savvy Makeup Line and it was a HUGE deal! NO synthetic fragrances or colorants! -This year they added Mascara (LOVING IT) it has lavender in it and glides on beautifully without smudging. - A matte veil that will rock out your makeup for an ultimate finish. - #1 Palette, can I tell you how excited I was about this??? Not only are the 5 colors gorgeous, but they are easy to travel. All in a convenient compact and easy to use. Oh and of course blended with lavender essential oils. And its name gives me hope that they are expanding with even more palettes soon! 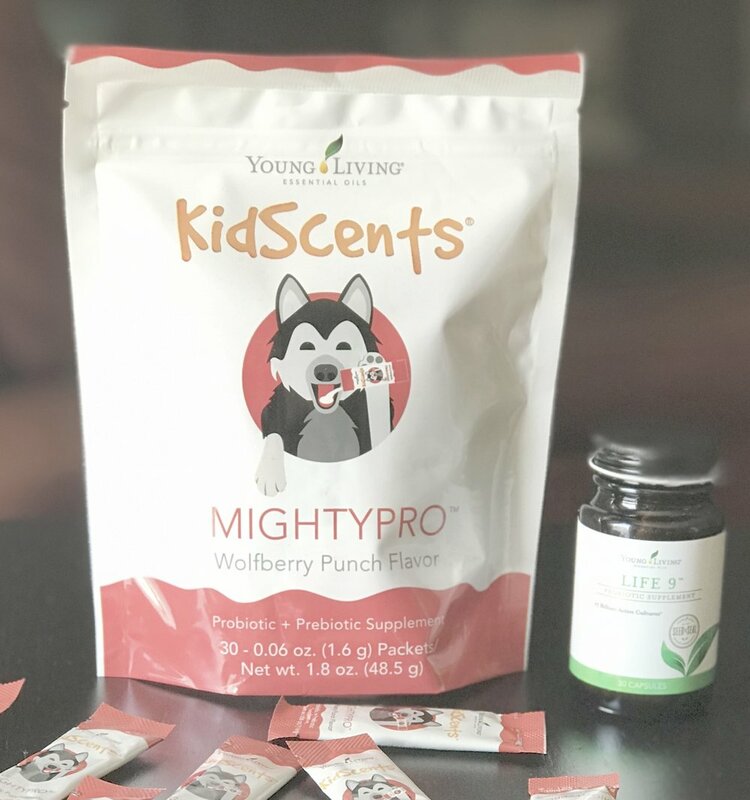 #7 Kidscent MightyPro Prebiotic and Probiotic for kids. Okay, seriously Young Living you are amazing. My kids are loving these, no whining about swallowing a pill or the bad taste. They taste like candy, so Mom’s beware. Healthy guts are ultra-important and this will help maintain healthy bacteria in the gut, colonize the GI tract and promote digestive health. Make sure to stock up on these Mom’s and be prepared for back to school germs! Young Living always releases a new essential oil at convention this year D. Gary Young formulated 3, which was very special because it was the last blends he made before his passing. Of course, they are always works of art and never disappoint. Journey On was a commemorative blend you could only get at convention. It is a grounding earthy blend of over thirty-four essential oils like Frankincense, Sandalwood, and even some blends like Dream Cather and Motivation. Freedom was this year’s mantra at convention and the other convention special blend. It’s also one with some brilliant oils like Lavender, Idaho Blue Spruce, Vetiver, Peppermint, Palo Santo, Valerian, Copaiba and Sacred Frankincense. Designed to apply to temples at night to inspire feelings of freedom from everyday troubles. Kunzea not only smells incredible but offers a clean woodsy aroma. I am loving this one diffused with citrus and it’s been excellent when added to my skincare routine. If you like any of the Eucalyptus oils, you most likely will enjoy this one. Young Living continues to do amazing work and research to help bring us top of the line, clean products in a responsible and compassion way. As the leader and pioneer of the industry, they always have me excited for what they will come up with next. Don’t forget to head over to Instagram to give us a follow and a comment. July is a month of contest and giveaways, so don’t miss out!